We have the ability to produce, synthesize and manufacture large quantities of 2-Chloro-4-Amino-6,7-Dimethoxyquinazoline(23680-84-4) with quality control system under CGMP manufacturing regulations. 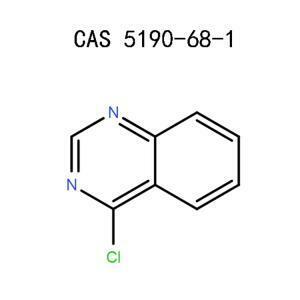 Quinazolines are a big family of heterocyclic compounds with anti-cancer properties.Cytotoxicity assays were performed for all compounds against different cell lines such as Human colon carcinoma (HCT116), Human chronic myeloid leukemia (K562) and Human breast cancer (SKBR3) cell lines using 3-(4,5-Dimethylthiazol-2-yl)-2,5-Diphenyl tetrazolium Bromide (MTT), Trypan blue and Lactose dehydrogenase release assay. The selected compounds were evaluated for their anti-tumor and anti-angiogenic effect on EAC tumor model. The molecular docking studies were drawn using maestro 2D sketcher and energy minimize was compounded by OPLS 2005. The current study focused on balancing potency and selectivity with metabolic stability through structural modification to the metabolized site on the quinazoline core. The performed extensive structure-activity and structure-property relationship studies on this quinazoline ATM kinase inhibitor in order to identify structural variants with enhanced selectivity and metabolic stability. It shows that, while the C-7-methoxy group is essential for potency, replacing the C-6-methoxy group considerably improves metabolic stability without affecting potency. Promising analogues 20, 27g, and 27n were selected based on in vitro pharmacology and evaluated in murine pharmacokinetic and tolerability studies. Compound 27g possessed significantly improve pharmacokinetics relative to that of 4. Compound 27g was also significantly more selective against other kinases than 4. Therefore, 27g is a good candidate for further development as a potential radiosensitizer. ♦ Wash skin thouroughly after handling. ♦ Use only outdoors or in a well-ventilated area. ♦ Store in a well-ventilated place. Keep container tightly closed. ♦ Dispose of contents/container to an approved waste disposal plant. A robust economic approach to N-(quinazoline-4-yl)sulfonamides was developed and synthesized different aryl, hetero aryl, alkyl and cyclopropyl sulfonamides in excellent yields. 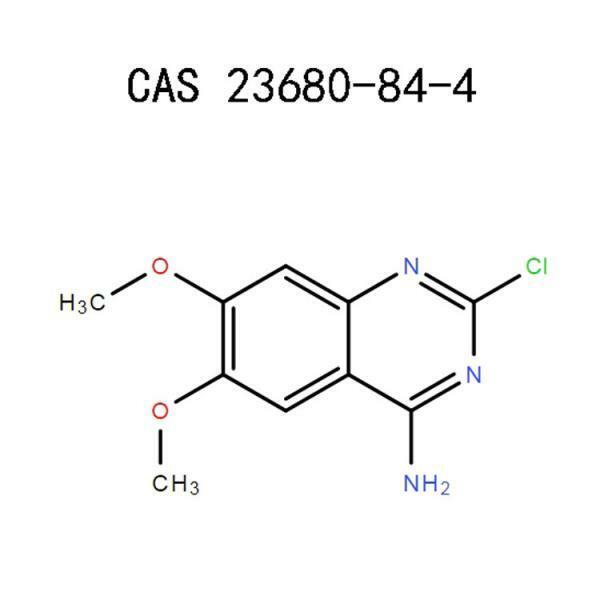 Are you looking for a place where you can buy high-quality 2-Chloro-4-Amino-6,7-Dimethoxyquinazoline (23680-84-4)? Look no more since Apicmo.com have got you covered. We are manufacturers of the highest-grade of 2-Chloro-4-amino-6,7-dimethoxyquinazoline products. We produce our products in strict adherence to the current good manufacturing practice (cGMP), among other regulations that govern the manufacturing industry. Whether you need the products in small or large quantity, we certainly have got your back. Quinazolines are a large family of heterocyclic compounds with anti-cancer properties. 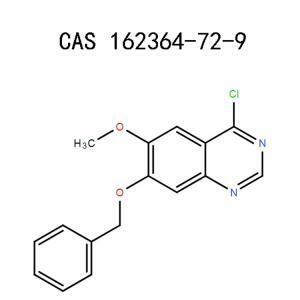 Cytotoxicity assays were done for all compounds against various cell lines including Human breast cancer (SKBR3), Human colon carcinoma (HCT116), and Human chronic myeloid leukemia (K562) cell lines using Lactose dehydrogenase release assay, 3-(4,5-Dimethylthiazol-2-yl)-2,5-Diphenyl tetrazolium Bromide (MTT), and Trypan blue. The selected compounds were evaluated for their anti-angiogenic and anti-tumor effect on EAC tumor model. The molecular docking studies were drawn using maestro 2D sketcher and energy minimize was compounded by OPLS 2005. The current study focused on balancing selectivity and potency with metabolic stability through structural modification to the metabolized site on the quinazoline core. The performed extensive structure-activity and structure-property relationship studies on this quinazoline ATM kinase inhibitor in order to identify structural variants with metabolic stability and enhanced selectivity. It shows that, while the C-7-methoxy group is essential for potency, replacing the C-6-methoxy group considerably improves metabolic stability without affecting potency. Promising analogues 20, 27g, and 27n were selected based on in vitro pharmacology and evaluated in murine pharmacokinetic and tolerability studies. Compound 27g possessed significantly improve pharmacokinetics relative to that of 4. Compound 27g was also significantly more selective against other kinases than 4. Therefore, 27g is a good candidate for further development as a potential radiosensitizer. 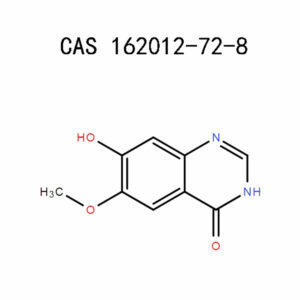 2-Chloro-4-Amino-6,7-Dimethoxyquinazoline is identified by C.A.S No. 23680-84-4 while its molecular formula is C10H10ClN3O2. Also called 4-Amino-2-Chloro-6,7-Dimethoxyquinoline, the compound is toxic if swallowed, inhaled or touched and so, its application is limited exclusively to research and development. Besides, it should only be used by or under the supervision of a person who is technically qualified. Whether someone calls it 4-Amino-2-Chloro-6,7-Dimethoxyquinoline, 4-Amino-2-chloro-6,7-dimethoxyquinazoline, 7-DiMethoxy-Quinazoline, 4-Amino-2-Chloro-6,7-Dimethoxyquinoline or 2-Chloro-6,7-dimethoxy-4-quinazolinamine, all these names refers to the same product- 2-Chloro-6,7-dimethoxy-4-quinazolinamine. With a chemical formula C10H10ClN3O2, 2-Chloro-4-Amino-6,7-Dimethoxyquinazoline has an exact mass of 239.04600, molecular weight of 239.65800. Its PSA and LogP are 70.26000 and 2.46380, respectively. 7-DiMethoxy-Quinazoline is normally in off-white solid form and its melting point ranges from 262-278ºC (dec.) while its boiling point is 374ºC at 760 mmHg. The product’s Flashpoint is 127°C(lit. ), Vapour pressure is 8.63E-06mmHg at 25°C, the refractive Index is 1.649 and the relative density is 1.391 g/cm3. The product is usually stable if stored under the recommended conditions. 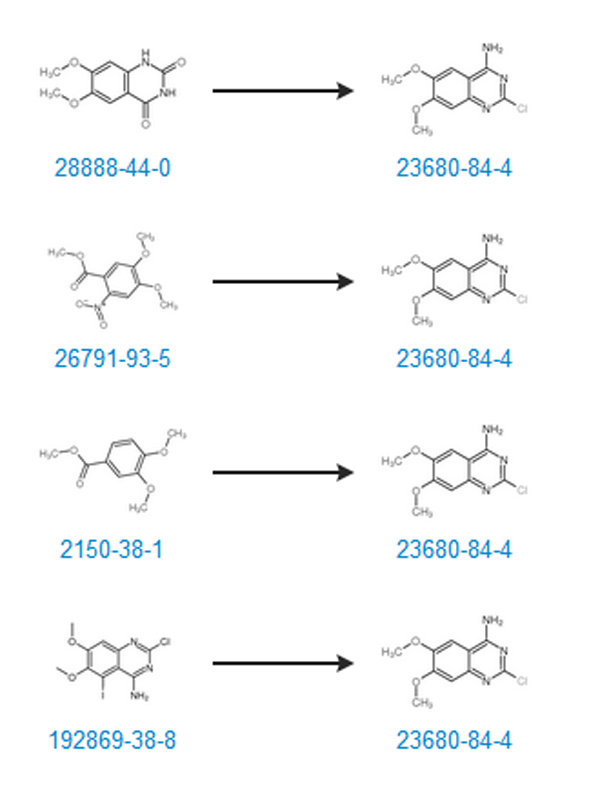 2-Chloro-4-Amino-6,7-Dimethoxyquinazoline (23680-84-4) recommended synthesis route. With Acute toxicity – Oral, Category 4, the compound is can be harmful to a person or animal if swallowed. For that reason, a person is cautioned against eating, drinking or smoking when using the product. If by bad luck someone breathes in the compound, it can cause serious irritation to his or her respiratory system. in as such, in a strive to reduce its effects, the victim ought to be moved to a place with fresh air. If the person is not breathing, it is advisable that he or she be given artificial respiration as a form of first aid. The victim should then be rushed to a healthcare facility soonest possible. 7-DiMethoxy-Quinazoline can also be harmful if swallowed. As it passes the digestive tract the compound might cause irritation to the digestive system. If you accidentally ingest the product, you are advised to wash your mouth thoroughly with clean water for a couple of minutes. However, this is just first aid. You should also seek medical attention as soon as possible. If its another person who has digested the chemical and they are too weak to take care of themselves, help them with the first aid and to get medical aid. Your skin or eye is also likely to suffer if it comes into contact with 2-Chloro-6,7-dimethoxy-4-quinazolinamine,4-Amino-2-chloro-6,7-dimethoxyquinazoline as the compound can cause severe irritation. A person who accidentally gets into contact with the compound should remove the contaminated clothes and shoes and then flush the affected skin area with lots of water and soap for not less than 15 minutes. In case of eye contamination, flush the affected eye(s) with a lot of water for not less than 15 minutes. As you do this, lift your upper as well as lower eyelids occasionally to ensure that the water eliminates as much of the chemical as possible. You should then seek the doctor’s attention. Wear protective eyewear: As we have seen here earlier on, the product can cause eye irritation if it comes in to contact with your eyes. To avoid such, it is important that you put on safety glasses with side shields that conforms to EN166. Preferably, the glasses should be tested and approved under prominent legal standards like NIOSH (US) and EN 166(EU). Put on a dust mask: the best way to avoid inhaling this product is by wearing a dust mask. You are also advised to prevent it from forming dust or aerosols to avert inhalation risks. If you are in a place where dust is formed, you should provide proper ventilation exhaust. Put on gloves: you should also wear impervious clothing, particularly gloves that meet the EU Directive 89/686/EEC specifications as well as EN 374 standard. The gloves ought to be inspected before someone wears them to handle 7-DiMethoxy-Quinazoline. Once you are done with the use of the product, remove the gloves without touching their exteriors to avoid skin contact with it. Then, dispose the used gloves according to the applicable laws as well as the good laboratory practices. Lastly, wash your hands well and dry them before proceeding to your next activity. Besides, you shouldn’t eat, drink or smoke while handling it, whether it is in the form of dust, vapor, mist or gas Basically, you should minimize your exposure to the chemical as much as you can. As you use this product, ensure that it doesn’t leak or spill to prevent the aforementioned adverse effects. In case of spillage, absorb its spill using an inert material such as dry sand and then dispose of it into a chemical waste container. Don’t allow it to enter drains or any way that it can cause its discharge to the environment. When using the product, ensure that you wash your hands before going for a break as well as at the of a workday. When not in use, the product should be put in a container that’s tightly closed and then stored in a cool, dry and ventilated place. Considering the possibly harmful nature of the products, its disposal should be done carefully and appropriately. It can be safely disposed of by an authorized chemical destruction plant or through controlled incineration involving flue gas scrubbing. The product should never be discharged to sewer systems. For the containers that have been contaminated with the product, they can be triply rinsed and then recycled or reconditioned. Otherwise, you can puncture the containers to render them unusable for other applications and then dispose of them into a sanitary landfill. In case of a fire outbreak involving the product, cover yourself properly with self-contained breathing apparatus as well as protective gear before you start to put the fire off. Use water spray, chemical foam, carbon dioxide or even dry chemical to turn off the fire. The product is incompatible with carbon dioxide, acid anhydride, strong oxidizing agents as well as acids and their chlorides. Apicmo prides a dedicated team of top-notch scientists with in-depth expertise in various research areas such as chemical synthesis, chromatography as well as chromatography. Place an order with us for large amounts of 2-Chloro-4-Amino-6,7-Dimethoxyquinazoline for your research or industrial manufacturing needs. You can rest assured that our friendly customer service will handle your request and provide you with precisely what you need. National Centre For Biotechnology Information, US. National Library of Medicine, Pubchem,2-Chloro-4-Amino-6,7-Dimethoxyquinazoline, Sections 1-9. William Andrew Publishing, Elsevier, 22 Oct 2013 – Medical, Pharmaceutical Manufacturing Encyclopedia, page 12-15. Ruben Vardanyan, Victor Hruby, Elsevier, 10 Mar 2006 – Medical, Synthesis of Essential Drugs, page 12-18.